Finished the right front last night. I’m particularly pleased with the shaping diagonal while keeping the chevron pattern correct. That took quite a bit of thinking and tinking! The first attempt was too dramatic a slope losing all the width in half the height. 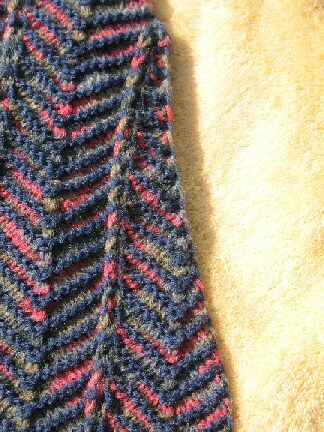 Here I not only reduced the fourth stripe as I knitted it but I went back and unknitted the third stripe down to where the fourth stripe joined in and then reduced the third stripe to the top. hey this is amazing how long did this take? It knits up much quicker than you might imagine. And because you’re knitting in narrow strips it seems to grow much faster. It probably took about a week to do the first front, and then 2 weeks to do the second front. The trouble is I have to fit the knitting in around work and domestic chores. 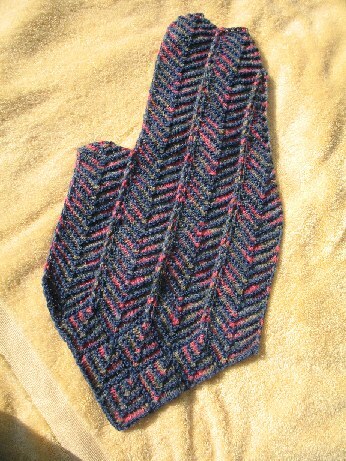 If I could just focus on knitting then I could get the whole thing knitted in a week! Where can I get this pattern? Sorry, I don’t have a pattern – I made it up as I went along. And to be honest, I can’t remember what I did. It was originally based on ideas from Patchwork Knitting.